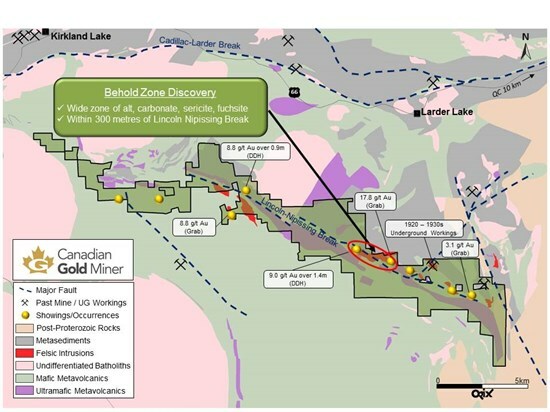 Sudbury, Ontario--(Newsfile Corp. - January 9, 2019) - Canadian Gold Miner ("CGM" or "the Company") and Transition Metals Corp. (TSXV: XTM) ("Transition Metals") are pleased to announce the discovery of a new gold zone dubbed "Behold Zone" located approximately 10 kilometres south of Kirkland Lake, Ontario. The zone is located near the northwest edge of a recently identified 800 metre long, Induced Polarization (IP) chargeability and resistivity anomaly occurring within a favourable structure and alteration corridor that the Company has been able to trace for more than 1.5 kilometres along strike. 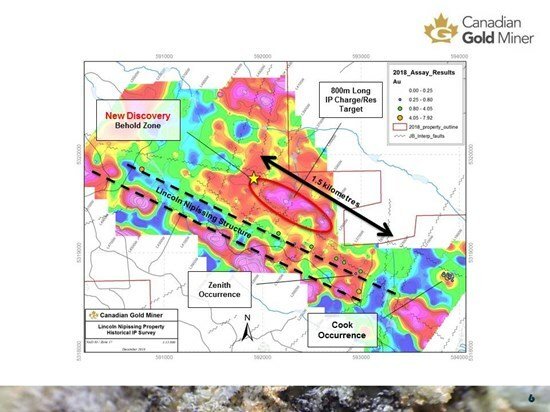 Canadian Gold Miner CEO Greg Collins commented, "Our work has highlighted a large exploration target located just south of the heart of the Kirkland Lake gold mining camp (Fig. 1). Trenching has exposed sub-cropping mineralization more than 800 metres northwest from a cluster of strongly mineralized occurrences identified and sampled by the Company in 2017. The newly discovered Behold Zone occurs near the interpreted northwest end of an IP anomaly approximately 300 metres north of the Lincoln Nipissing break. The Lincoln Nipissing Fault has recently been highlighted by the Metal Earth research initiative as an underexplored fault system having similar characteristics to other major gold producing structures in the Abitibi." Field work completed in 2017 by the Company highlighted an approximate 500 metre wide corridor that hosts extensive alteration associated with favourable structure developed around the Lincoln Nipissing Fault northwest of the Cook and Zenith showing areas reported in 2017 (Fig. 2) (see news release dated Sept 14, 2017 - Canadian Gold Miner Sampling at Cook Showing in South Kirkland Returns of up to 8.13 Grams per Tonne Gold in Selected Grab Samples). Channel sampling at the Behold Zone in late 2018 has returned assays ranging from nil to 8.6 g/t Au over 0.30 metres and 5.42 g/t Au over 0.67 metres from select channel samples (Table 1). The Behold Zone is situated 800 metres northwest of any previously known mineralization. In September, the Company engaged geophysicists from Intelligent Exploration services to review historical IP data collected over this area. Intelligent Exploration highlighted an 800 metre long untested coincident chargeability and resistivity anomaly situated at the core of this now 1.5 kilometre long open mineralized trend. The technical elements of this press release have been approved by Mr. Thomas Hart, P.Geo. (APGO), a Qualified Person as defined under National Instrument 43-101. All samples were collected by Company representatives under the supervision of the Qualified Person and transported directly by the company to the lab. Transition Metals employs in-house QA/QC procedures that conform to industry best practices. All analytical work was conducted at ALS-Chemex with sample preparation completed in Sudbury, Ontario and analyses completed in North Vancouver, B.C. The quality system used by ALS-Chemex complies with international standards ISO 9001:2000 and ISO 17025:2005. All reported historical values have not been independently verified by the Qualified Person and as such do not conform to NI 43-101 standards for disclosure, and should not be relied upon. Canadian Gold Miner Corp. is 39% owned by Transition Metals Corp (TSXV: XTM) and is a Canadian private corporation focused on exploring for gold in the Larder Lake Mining District near Kirkland Lake. The Company was founded by Transition to leverage its data, expertise and extensive portfolio of high quality gold projects. CGM has assembled a dominant land position in excess of 229 square kilometres around the Cadillac Larder, Lincoln-Nipissing and Ridout Structures in the southwestern part of the prolific Abitibi Greenstone belt in Ontario. The Abitibi Greenstone belt is Canada's most prolific gold district located in a stable political jurisdiction with excellent mining infrastructure in place.